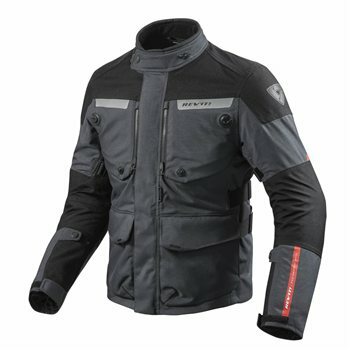 Outer shell PWR | shell 500D 2L | This material is REV’IT!’s take on Cordura®. Consisting of 100% high-performance Polyamide yarns, PWR|shell takes the best properties of Cordura® - high melting point, tremendous tear- and abrasion-resistance, and excellent durability - and puts the unique REV’IT! design stamp on it. PWR|shell provides high-performance protection for every rider. PWR | shell 1000D 2L | Lorica® | This material is REV’IT!’s take on Cordura®. Consisting of 100% high-performance Polyamide yarns, PWR|shell takes the best properties of Cordura® - high melting point, tremendous tear- and abrasion-resistance, and excellent durability - and puts the unique REV’IT! design stamp on it. PWR|shell provides high-performance protection for every rider. Protection SEEFLEX™ Level 2 CE protection | Certified CE-Level 2 according to the new norm EN1621-1:2012 the SEEFLEX™ protector is the latest innovation from the in-house R&D department. The new norm also tests the impact levels in various temperature ranges. The SEEFLEX™ protectors easily surpass the new norm without sacrificing wearer comfort. Prepared for SEESOFT™ CE-level 2 back protector insert - Type RV |The back protector pocket in this REV'IT! garment is tailor-made to accommodate the SEESOFT™ CE-level 2 back protector insert Type RV - an easy upgrade to maximize safety. laminated reflection |Reflection panels ensure excellent visibility at all angles, allowing the wearer to be seen from all directions. To offer a more sophisticated look, the reflection panels are welded to the fabric. This welding process also eliminates stitching seams, making the garments safer. Hydratex® | Lite provides all-weather protection with just one layer. The inner surface of the outer shell features a waterproof coating with micropores, which keeps rain and wind out. flexisnap | The REV’IT! flexisnap makes it possible to adjust the collar circumference easily and personalize its fit to each rider. A jacket is often worn in more then one season, and the flexisnap makes it possible to adjust the collar within seconds. During winter a wider collar circumference accommodates combining the jacket with a balaclava or wind collar, while during summer, a wider circumference lets an all-important cooling wind into the collar. VCS | zipper Our VCS zippers are all located in strategic positions, where they offer excellent air flow to cool the body. The air flow can be regulated by opening or closing the zipper. VCS | panel with FidLock® magnetic fastener | Removable panels for optimum ventilation. Ventilation is nice on warmer days, but not as desirable in cold weather. The panels can be kept open due to the FidLock magnetic Fastener. The Fidlock® magnetic fastener not only uses the attraction but also the repulsion of magnets. This leads to a robust closure with high locking strength that can still be easily opened with one hand while riding. prepared for vest connector HV | The Vest connector HV allows you to the upgrade your jacket with a HV vest that quickly and easily attaches. The highly visible EN471-certified vest offers enhanced safety. collar hook | The collar hook and loop allow you to draw back the front side of the collar, allowing air flow to cool the neck during warmer periods of the year without the annoying flapping of the loose collar. short and long connection zipper Thanks to the short and long connection zipper, this jacket is/these trousers are compatible for pairing with any pair of trousers/any jacket in the REV'IT! line.